Illuminated with the traditional Hyo elements of design, the Trinity Cross Pendant w/ Ruby Red is a popular item. 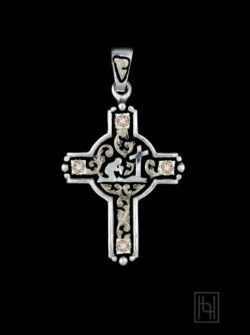 The small sterling silver cross is united with yellow gold overlay scrolls and a rose gold flower holding a colored crystal. A black antique background creates contrast to the brilliant hues of silver and gold.